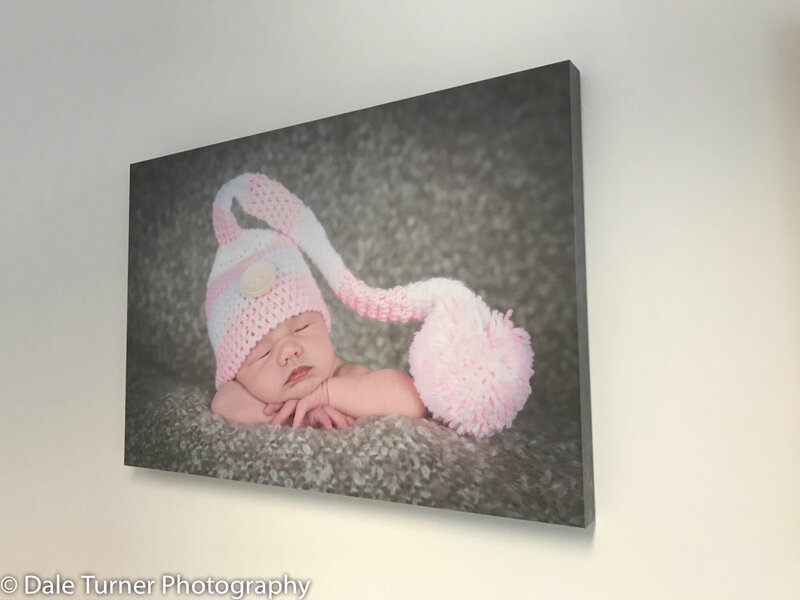 A selection of products available from Dale Turner Photography. All your prints will be produced by a professional print laboratory, they are scratch resistant and guaranteed not to fade. Sizes 6”x4”, 7”x5”, 9”x6”, 10”x8” & 12″x8″ come supplied in a signature black card strut mount. All other sizes up to 16”x12” come in a clear plastic wallet and hard backed envelope for protection. Sizes above 16”x12” come rolled up in a solid card tube for protection ready for framing. Your premium canvas will be produced by a specialist in the industry. I believe your images deserve to be on the best possible product. These are unlike any other canvases on the market. The museum grade 100% cotton canvas is applied to a wood face – not a hollow frame. This ensures they will never sag or wrinkle. They have the tightest corners in the industry and a fully finished back with hanging bracket and wall bumpers. The UV coating ensures fade resistant longevity. I have listed the most popular canvas sizes on the Prices page, but if you require a different size just let me know. They come with a diamond polished high gloss finish and the end result is truly amazing. With no corner brackets, they give the illusion that they float slightly off the wall adding an even bigger wow-factor. Simply stunning. Each acrylic panel comes with a pre-fitted hanger on the back which makes them really easy to hang in your home or office. Also suitable for high humidity areas of your home such as kitchens and bathrooms. I have listed the most popular acrylic panel sizes on the Prices page, but if you require a different size just let me know. Your wedding book will be hand made in Italy by Graphistudio using the finest materials available. There is a huge choice of paper types & cover options so together, we can create something unique which perfectly compliments the theme of your wedding. Graphistudio only work with professional photographers who photograph a certain number of weddings per year. Their products cannot be sourced by anyone who is not a busy, full-time professional wedding photographer. I am delighted to be able to offer something very special for my newborn photography clients - The Baby Book. They are hand made in Italy by Graphistudio (same as my wedding books) and come in a gorgeous presentation box. The Baby Book is very special and a great way to showcase your favourite images from your newborn photography shoot. You pick your favourite images and I will design the book, but it won't be printed until you have approved the layout.